Who hasn’t pretended to be a dinosaur at some point during their youth? Even if you didn’t pretend to be a T-Rex, you still pretended to be a Pterodactyl, right? Or you were one of the weird kids who pretended to be a Dilophosaurus and spit on people. Don’t lie. Admit it! It’s okay! Dinosaurs are awesome, after all, and I mean that in the sense that they inspire awe. Just looking at the fossils of these ancient creatures sends a shiver down humankind’s collective spine as we are forced to reflect about how helpless we would be if these creatures were alive, hungry, and numerous. Still, others may look at those old bones, and imagine what kind of an arsenal would be necessary for us to come out on top in that fight, because they’ll be damned if they’re gonna let those giant lizard bastards overrun us just because they think they’re at the top of the food chain instead of us humans. 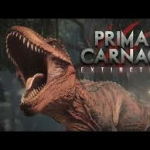 Primal Carnage is an incredibly immersive, adrenaline-pumping first person shooter that gives players the chance not only to face the terror would be a Tyrannosaurus Rex (or three), but a chance to be that terror. The setting is captivating, with overrun bases, littered with abandoned labs, helipads, ports, trucks, planes, and ships, all almost completely overrun by flora, which is so detailed and thick that you will find yourself trying to brush away vines and shrubs during your mad dashes from cover to cover. The tall trees, empty towers, and construction cranes form an ominous canopy of shadows from moonlight and sunlight over the battlefields. The obfuscating shadows gives the jungles in the game an almost tangibly hopeless, muggy quality, whether playing in full sun, or in a dank drizzle. All surfaces are thoughtfully textured, especially the dinosaurs’ skins. They’re rough, tough, and scaly, almost scabby in some areas. The T-Rex’s powerful muscles flex with natural grace as she charges towards a group of scared humans, her mammoth size causing the ground to quake beneath their fleeing feet. When she chomps down on her prey, she gobbles them up, still screaming, with the relish someplace between that of a dog given their favorite treat and a pelican given their favorite fish. Depending on who you’re playing in that scenario, your face will distort into a delightful giggle or a comically defeated frown. Either way, it’s a fun scene to watch. 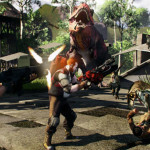 If you manage to survive, you’re now caught up in a blinding firefight of muzzle flash, bullet trails, pyrotechnics, and explosions as your entire team tries to take down the T-Rex who is still happily munching on your ex-teammate, who is still screaming. The music during the menu screen is epic enough for the armies of Sauron. It’s a shame there isn’t more of it, because it would be awesome during gameplay, and it’s a little repetitive, even for a menu screen. Hopefully we can get more of it before the full launch. 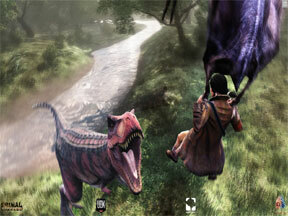 In terms of sound effects, the audio clues in Primal Carnage provided sufficient information to the players about their surrounding conditions, both practically and aesthetically. All six of the dinosaur classes have distinct roars to indicate when they’re attacking, attacked, or using an ability. Footsteps change based on model size, ground texture and movement speed. Each gun makes a unique sound that changes based off of firing distance. Bullets make nice little wooshing sounds when coming close and will cause ricochets to pang out. There are even lovely little chirps of bird and insects. And then there’s the screaming. Good God, the screaming. It’ll cover up all those lovely details for a second, until the bone-crunching is over with anyway. “Not the face!” is a personal favorite of mine, which let’s me know a Commando nearby needs a Novaraptor shot off of him within the next few seconds, if I’d like to keep him alive long enough to inevitably return the favor. For all of Primal Carnage’s attention to detail regarding sensory experience, the game-play leaves something to be desired right now. The controls are a little difficult to manipulate. The big dinosaurs basically just charge around, with some aim, lucking out on how many breathless meatbags they can crush under each footfall. The little dinosaurs run in circles, continuously gnashing at everything until they happen to bite an opponent. At first, I thought it was just me, and was relieved to notice that I was not the only sucker continuously falling out of the sky as a Pteranodon for no reason. It’s very disconnecting (disenchanting?) to watch supposedly natural-born flyers take to the skies only to take their noses to the grounds in mass, species-wide, cross-eyed, fruitless, suicidal dive bombs. The idea and use of “sprinting” is interesting, but ultimately, it seems to take away more than add. Dinosaurs can already out run and out maneuver humans 95 percent of the time, no matter who is sprinting and who isn’t, making the concept almost moot. 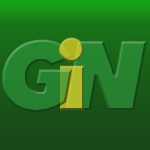 Another glaring issue was team-balance. Dinosaurs have more HP that humans, sometimes way more, while humans all have the same HP, yet all kills are worth the same number of points. I found that it was almost impossible for humans to win a deathmatch the way scores are tallied and the way teams are balanced, and the Dinosaurs can hardly ever prevent an escape to the chopper (capture and hold). There are some situations where it simply does not matter what choices you make as a human, you will not survive, which can be rather frustrating and discouraging. You will be devoured, or stomped, or pounced, and you’ll die and have to respawn. Often, that means respawning opposite the map from your human teammates, in between three T-Rexes, which means that you’re as good as dead, and you’ll have to respawn again and hope that more of your teammates have died and will now respawn near each other so you can even stand a chance to live longer than half a minute. The tactics needed to win for dinosaurs are ham fisted and require little strategy, while the humans are hamstrung from organizing their necessarily more complicated plans by a lack of voice command capabilities. In a sense, most of these issues help lend an element of chaos, which is exactly what one should expect if they were to find themselves in the middle of Raptor Island. The fact that you feel like you need to sprint from cover to cover in order to have a chance at survival kind of gets the adrenaline going. The fact that you are literally helpless without your fellow humans makes the cooperation among teammates feel paramount and organic, despite the lack of enlightened communication. Then again, maybe people experiencing a dino-infested world would be at a certain loss for words. Some of these flaws make the game frustrating and hard to take seriously, but strangely enough, these same flaws often serve to enhance the experience. Sure, it’s hard to dive down and kill people as a Pteranodon, but it’s really easy to glide, and the setting is so beautiful that it’s actually worth spending a few minutes soaring over the battlefield to simply take in the sights and sounds. It’s hard to come up with tactics, but it’s a blast running into a flock of NovaRaptors as a pyro and spinning around in a flaming circle of death until a T-Rex decides they’ve had enough of that. In a way, the fact that winning and losing is a forgone conclusion frees up the players to simply enjoy the exhilarating frenzy of simply surviving as long as they can. Though I hope that one of the points of the beta (the chopper mission is still in beta) is a little more team balance. That is probably going to be needed if Primal Carnage hopes to capture a large audience of players and hang onto them. In terms of value, the game is currently priced at $15. I think that’s a good value given the unlimited replay ability. If the gameplay is balanced out a bit more, then the Value score would rise along with it. Kudos to Lukewarm Games for making a unique and fun title that’s different from others on the market. That’s not an easy road for an Indy developer. 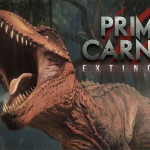 Primal Carnage is a good game, but with a few more tweaks and a bit more content, it could become a great one.